After a highly successful holiday season of outreach, celebration, and giving, the PH food closet is quite low on inventory! Please take a moment and jot down the current needs so you can pick them up on your next grocery visit! The Camp Christmas Party Team will be meeting Friday December 7th at 11am in the church compound courtyard to finalize party plans - all are welcome! 15 dozen cookes and 10 large bags of chips brought to church on Friday, December 14th. Thanks for praying that the message will be clear and compelling, heard and received. We could also use flour and tuna for the food closet. 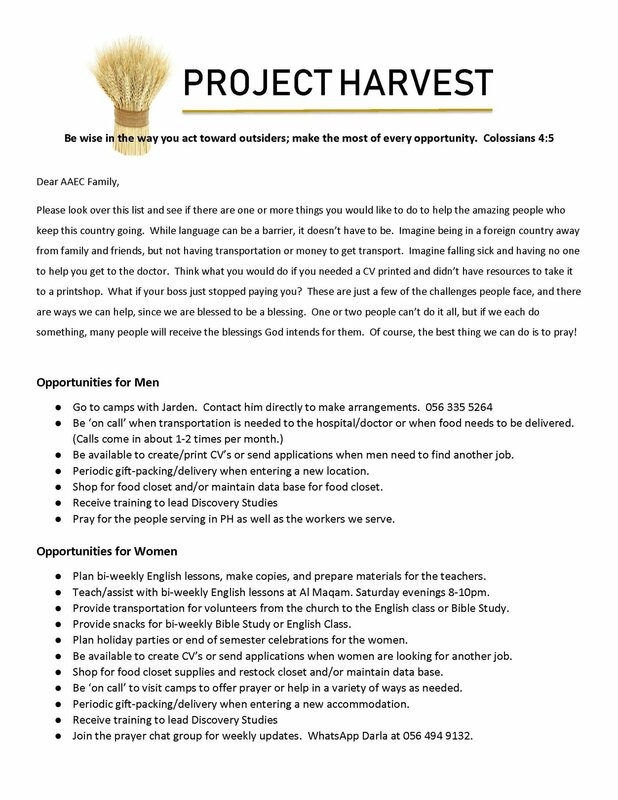 Ultimately, Project Harvest is about offering hope. Hope in areas where there’s hopelessness; love where people are often forgotten; and joy where there seems to be no reason to smile. With this outreach ministry, we desire to reach beyond the walls of AAEC by going to the places where people have often been forgotten, but where the hope of Christ is needed most. For more info, email projectharvest@aaec.ae, or hit the button below to shoot us a message.